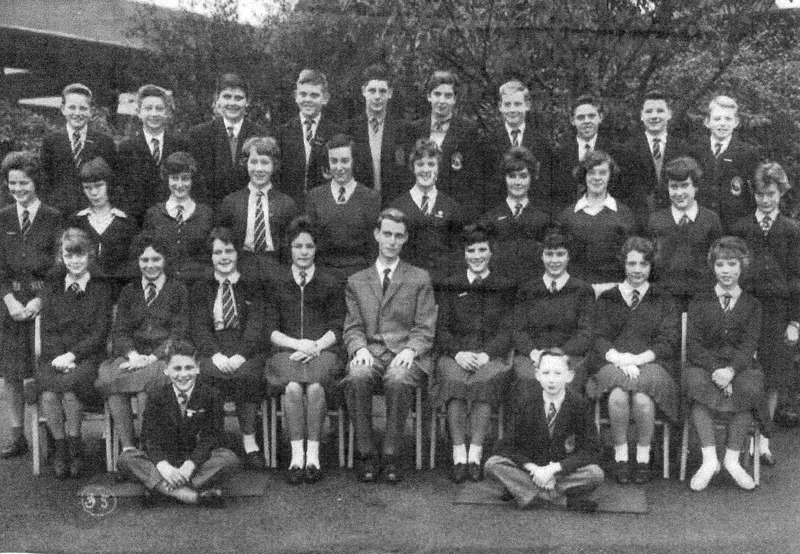 Westfield School – 1960s. Some of students are from Killamarsh. See note below. Photo courtesy of Christine Johnson (nee Bartholomew. Westfield School in the days when those who passed their 11 plus exam went to Halfway Grammar (which became Westfield School). Some of the students are from Killamarsh. Christine Johnson (nee Bartholomew is on the middle row and standing immediately behind her is her husband Paul Johnson. Back row: Left to right – ? Bacon, Paul Coster, Colin Pleasance, John Bannister, Unknown, Philip Robinson, Paul Johnson, Unknown, David Bramall, Peter Rippon. Middle row: Left to right – Christine Deffley, Nancy Hardwick, Daphne Thompson, Ann Mills, Joan Turner, Jennifer Wright, Christine Bartholomew, Kathleen Marples, Helen Shaw, Linda Keeton. Front row: Left to right – Lynne Hillaby, Susan Booth, Glenice Hargate, Suzanne Millward, MR HUNT, Susan Hutchinson, Jennifer Smith, Frances Conway, Glenis Wooley. Seated: Philip Illsley, John Pashley.